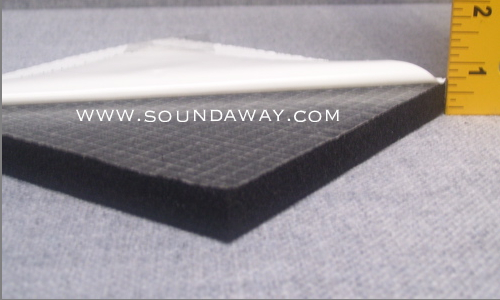 We offer the best closed-cell foam soundproof mats for all types of sound absorption and noise reduction applications. The SoundAway closed-cell foam mat with adhesive backing is durable and easy to install and can be cut to fit into virtually any space. The SoundAway Mat is 1/2" thick and comes in 3' x 4' sheets. This creates a high-density soundproof mat block that prevents the transmission of sound from even the noisiest sound studio or engine room. The closed-cell foam sheet blocks are fire- and mold-resistant and made from nontoxic materials. Create the perfect home theater, sound studio or private office with our closed-cell foam mats with adhesive backing for the ultimate in soundproofing technology. These soundproofing mats are affordable on any budget, and we offer the best prices. Buy now to take advantage of our low prices and fast shipping on all orders.